Be the first to share your favorite memory, photo or story of Georgine. This memorial page is dedicated for family, friends and future generations to celebrate the life of their loved one. On March 29, 2019, at the age of 88, Georgine Grace (Lloyd) Folz went home to the Lord when she passed away peacefully at Atrium Health, Pineville, North Carolina with family by her side. Georgina, as she preferred to be called, was born on June 2, 1930 in Winter, Saskatchewan Canada. She was predeceased by her parents, Archibald Herbert and Gladys Audrey (Smithson) Lloyd; brother, Glenn Lloyd; and sister, Audrey Hamel. She is survived by brother Harvey (Lorraine) from Vancouver Island, BC; sister Carol Eldridge (Kentucky); her four loving children, Allan Jerry (Mary Gene), Crown Point, IN; Gordon Howard (Teresa), Fort Mill, SC; John Kenneth (Cheryl), Raleigh, NC; Marcia Jean Conte (Rick), Greenville, SC; her 13 Grandchildren includes Allan’s 3 children, Allan Gene, Daniel, and Sarah; Gordon’s four children, Katharine, Jacob, Brandon and Ryan; Ken’s 2 children, Andrew and Heather; Marcia’s four children, Ricky, Marygrace, Caroline and Michael; and her 14 great-grandchildren. Georgina grew up on the family farm in Enderby, BC. After graduating from Enderby High School, she went on to be a waitress in the Vancouver area where she met and married Al Folz. They later moved with their four children to the San Fernando Valley area of California where they raised their family and Georgina continued to work as a waitress. While in California, she was active in her church and was known for her curiosity and desire to help other people. In her later years, she relocated to Pineville Rehabilitation and Living Center in North Carolina to be closer to her children. 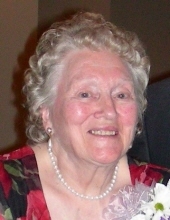 To send flowers or a remembrance gift to the family of Georgine Grace Folz, please visit our Tribute Store. "Email Address" would like to share the life celebration of Georgine Grace Folz. Click on the "link" to go to share a favorite memory or leave a condolence message for the family.